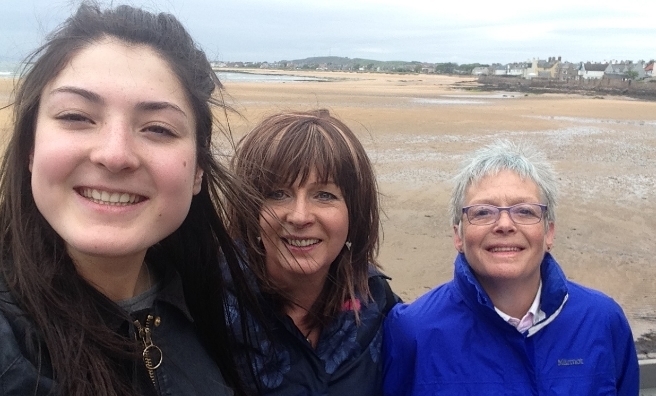 A short break in the East Neuk of Fife in the last days of spring with my aunt and my daughter (celebrating one retiral and one last ever day of school) was the perfect opportunity to walk a stretch of the Fife Coastal Path. We started our six and a half mile walk along the Fife Coastal Path at Cellardyke with views across the Forth to North Berwick, the Bass Rock and the Isle of May. On this particular morning, however, the weather had taken a swing back to winter so any potential views were shrouded in grey haar – but that wasn’t going to deter Auntie Lesley, my daughter Tasmin or me. 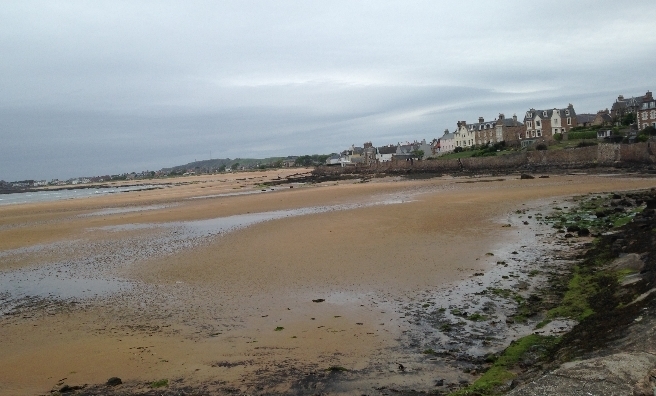 Especially because we were walking with intent – towards our lunch at The Ship Inn in Elie. 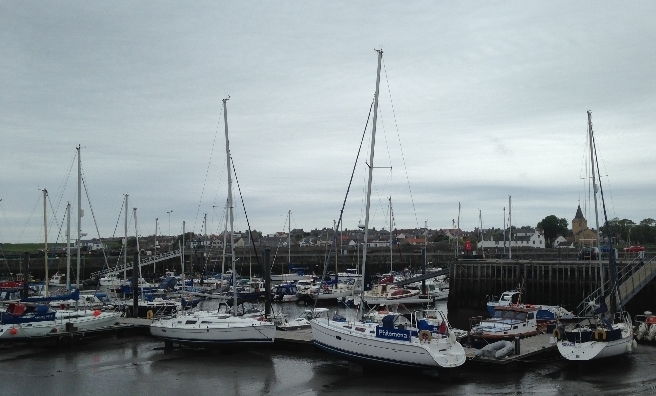 We set off at about 10am, following the Fife Coastal Path through Anstruther, with its busy harbour and bustling streets. 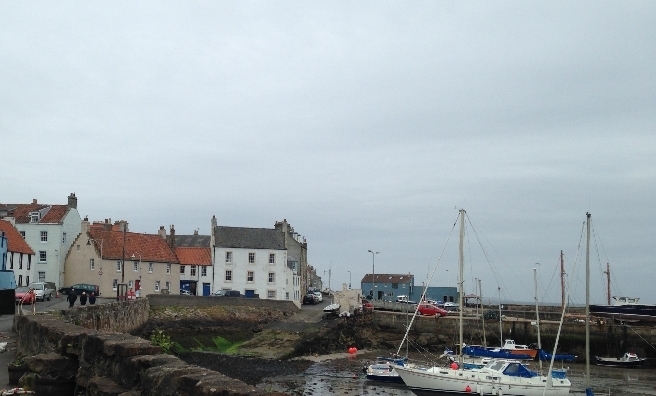 The Path actually leaves the coast as you leave Anstruther but it’s well signposted and only makes a small landward detour through the town. 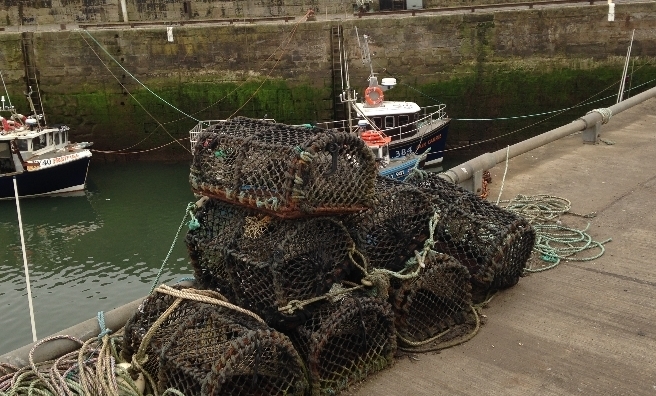 Next stop Pittenweem, where boats are a land and water feature, with the town’s fishing heritage and working harbour very much to the fore. 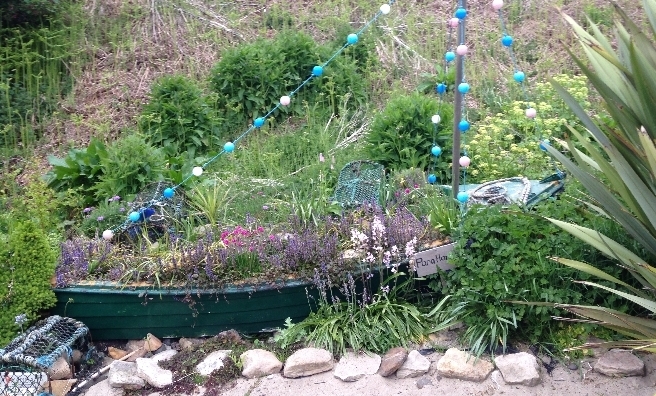 As we left Pittenweem, we spotted a beautiful boat-shaped, sea-inspired miniature garden alngside the path, with a lovely message to a much-loved grandad. The path was edged by wild flowers all the way to the salt pans on the edge of St Monans, with the windmill that played an essential part in salt production providing a very handy landmark to walk towards. If it had been a warmer day, we might have been tempted to go for a dook in St Monan’s sea-filled swimming pool, which is now crumbling away must have been quite a tourist attraction in its day. 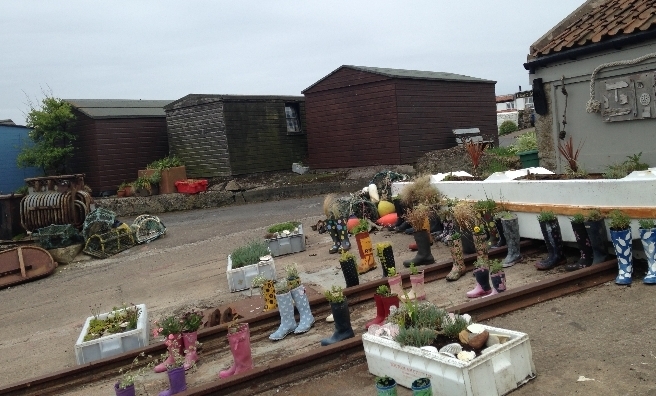 The Wellie Garden on the boat slipway at the far end of St Monan’s Harbour made us smile. Turning wellies, and fish boxes, into flower pots is inspiring! 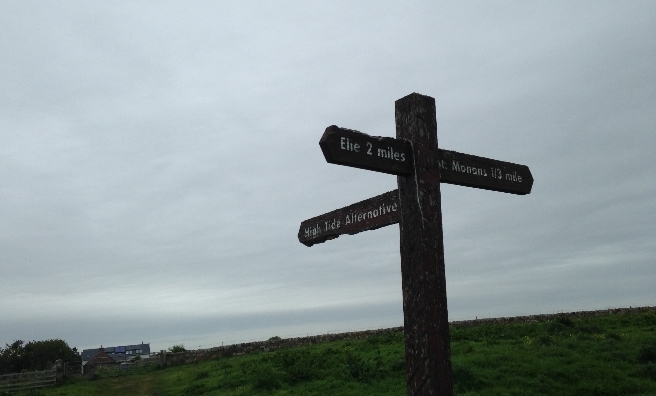 It was as we left St Monans that we had our one and only navigation blip as we seemed to miss a signpost. 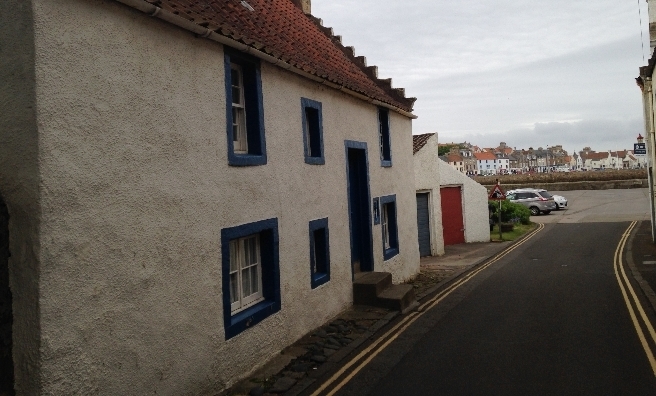 However, we soon rediscovered the trail, which went down a steep set of stairs between beautiful seaside cottages, coming out at the path leading to St Monan’s highly impressive church. At this point, the Coastal Path follows steps cut into the rocks which are actually quite difficult to spot – as was proven by Auntie Lesley’s brief demonstration of rock climbing! 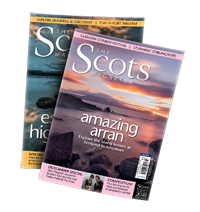 The path then follows the coastine, which is dotted with the ruins of castles and towers and also helpful signs to the farm shop at Ardross. … and there was Elie! 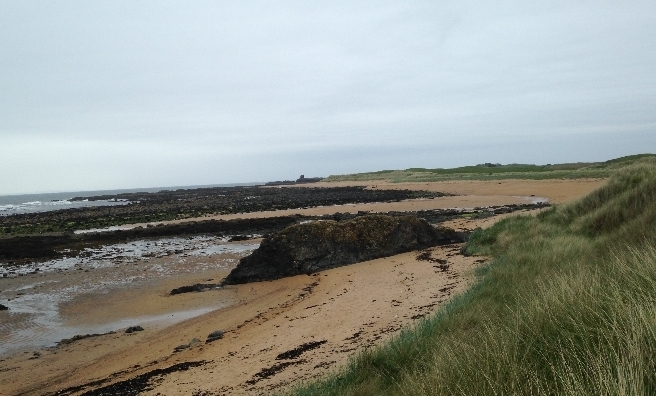 The ancient tower which stands at the tip of Elie’s bay was now very clear so we speeded up – lunch was calling! And, after a lovely chat with the owner of a Dandie Dinmount Terrier who dashed from one to the other of us saying hello, we climbed to the top of a sand dune and there was Elie. Lunch at The Ship Inn followed and then we jumped on the bus and within fifteen minutes, we were back in Cellardyke – beating the rain by minutes! 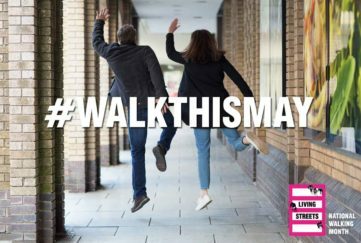 If you’re looking for a relatively easy, mainly flat Sunday Stroll – this is it! 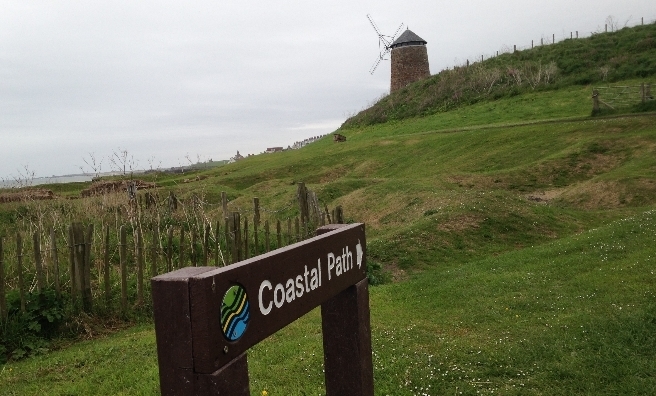 For more information about the Fife Coastal Path, click here. 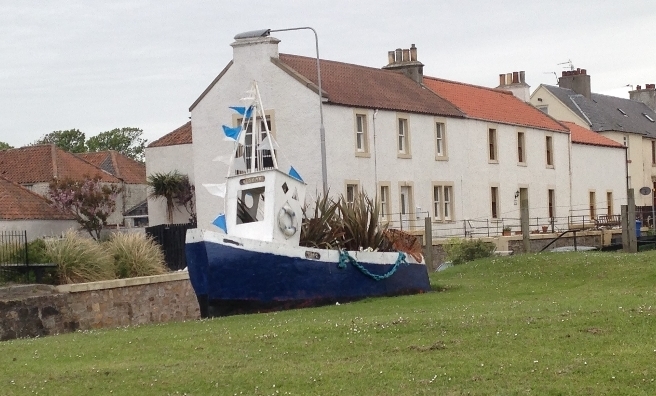 A nautical welcome to Pittenweem. 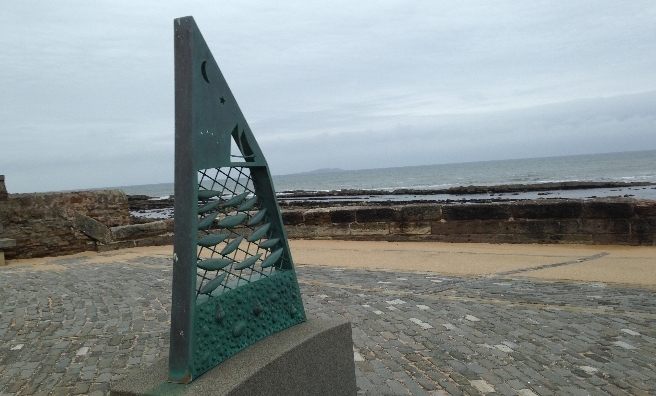 A beautiful memorial to a much-loved grandad overlooks the rocky beach at Pittenweem. Made it! Now for lunch at The Ship Inn!